An unlikely event, this one, as Black Label New York take over the plush Joe's Pub late on a Monday night for a free party. DJ Porkchop span an esoteric selection. Japanther, just returned from a lengthy cross country tour, performed as the crowd teased them by throwing firecrackers onstage. Then came the main event - as Japanther returned and did their set over - an onstage build of one of the tall bikes, that Black Label ride, and also use for their jousting tournaments. 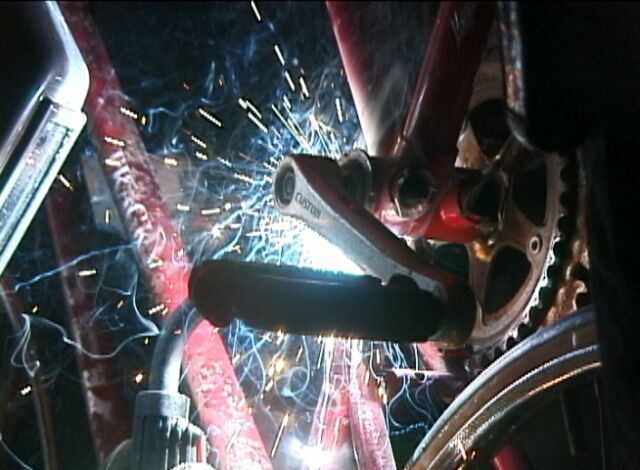 As a dysfunctional video projector showed scenes of past tournament glory above, in a shower of sparks two regular bikes were grafted on top of each other into one. . The whole thing took just 35 minutes, just as well as Japanther were running out of songs. Finally, the glorious creation stood tall. It was informally presented to a young female recruit, after which everyone went outside an impromptu series of jousting bouts on Astor Place. The clip is from about half way thru - at the critical unifying weld moment. And yes i have knocked up a VCD of the whole thing (11;37:33), you can get a copy from the pinstand for $4 inc. mail ($5 foreign) - if interested email orders@pinstand.com and ask VCD400.